Hutches Boarding offers holiday boarding for Rabbits & Guinea Pigs from weekends away to long term boarding throughout the year. Enjoy your holiday in the knowledge that your animals are safe, happy & enjoying their holiday at Hutches Boarding. Hutches Boarding is run by Joanne Lockley who has been involved in the Small Animal Boarding industry for many years. Joanne Lockley is well trained to look after your animals having previously been employed by pet shops, boarding kennels, vet's practice and various other animal companies. Joanne also has her own pet rabbits and guinea pigs. Hutches Boarding owners travel from near and far for their pets to have a fantastic holiday. Hutches Boarding has an expanding and very happy group of customers throughout Scotland from the Borders to Caithness. Let Joanne at Hutches Boarding take away the anxiety you may feel while your pet is on it's holiday by providing a dedicated environment with specialist care. Every care and need is provided from with heaters in winter and fans in the summertime. Each hutch is hoovered then treated with Johnsons cage and hutch spray and Pet disinfectant. 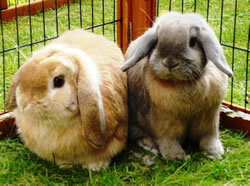 Rabbits stay in the main building or the outside cage area in either 6ft or 5ft hutches. Guinea pigs get to stay in my special shed (known as 'The Megashed') in either my 4ft to 5ft hutches. Joanne cares for 90 hutches from 6ft to 4ft. Joanne will allocate your pets hutch on arrival making sure your pet is allocated the correct hutch size required for an enjoyable holiday at Hutches Boarding. Please let Joanne know if it is your pets 1st time at Hutches if your pet is normally kept inside the home or outside all year round. Animals can relax in the sunshine when they are in their own outside runs May to September (weather permitting). All animals are checked at least 4 times a day. If your pet has any special needs whilst on holiday please do mention this prior to drop off and Joanne will do her best to provide for your pets needs. Your pets stay is all inclusive we provide everything for your pets stay including food, bottle, bowl, toys etc. All you need to bring and leave are your rabbit's vaccination cards.Rabbits require to have their MYXO-RHD vaccinations at least 2 weeks prior to their holiday. 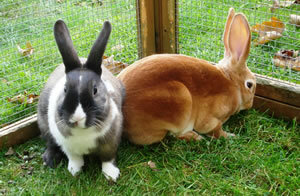 If you do not present your vaccination card your rabbit will be refused holiday boarding. Joanne will take your animal to our Blairgowrie vets, Castle Street in Blairgowrie. If your animal becomes unwell while on holiday. You must pay the vets fees charged on your return even on the sad event of your pet passing away. Open all other days including Good Friday and Bank holiday Mondays. For Christmas Holidays contact Joanne for working hours.